Rare original 'Groma Modell N' Waffen-SS Typewriter (Schreibmaschine). The Number 3 key is showing the 'SS' runes, all keys are still functional. Hard to find and complete original Waffen-SS Typewriter in good used condition! 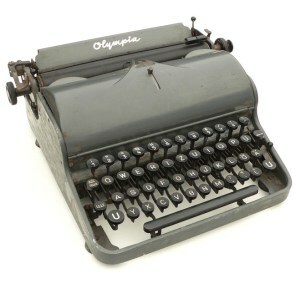 Rare original 'Olympia' Waffen-SS Typewriter (Schreibmaschine). The Number 5 key is showing the 'SS' runes, all keys are still functional. Hard to find and complete original Waffen-SS Typewriter in good used condition!